The Protect Wisconsin Waterways team gave the enviroscape presentation at Turtle Creek Elementary in Delavan. This event took place on Wednesday, February 20th. The after school group that consisted of fifteen 3rd and 4th graders, as well as a few of the kids’ tutors. 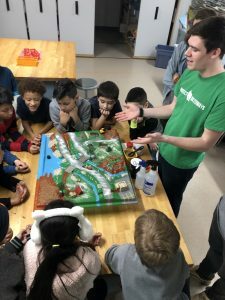 We showed the kids how pollutants like salt, loose soil, fertilizers, and grass clippings/leaves can find their way into our waterways through stormwater, which leads to pollution not only in our rivers, but ponds and lakes as well. Also, Splash came out after the enviroscape presentation to high-five and take pictures with the kids.